It's rare that I get to hang out with homebrewers who out-nerd me when it comes to sour beers. I've got a 60 gallon barrel of solera sour in my basement, a reasonable knowledge of both traditional and modern techniques, and a couple medals to my credit, but Dave and Becky Pyle make me look like a novice. 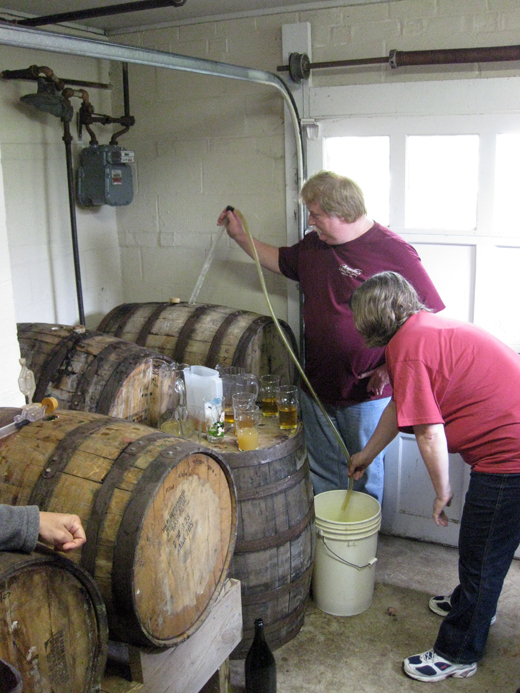 In 2005 Dave and Becky's Straight Lambic earned them NHC Brewer of the Year honors (that is to say it won in the first and second rounds against all of the other homebrewed sour beers in the country, and then took best of show against the winners from the 23 other categories). They have four barrels of spontaneously fermented Lambic in their garage, each in old bourbon barrels that Dave and a friend took apart, de-charred, re-toasted, and reassembled. So when I heard they were hosting a tasting and blending session for their next batch of Gueuze I was pretty excited. The morning started out with one of their signature creations, a mixture of orange juice and Lambic they call Gueuze-mosa. 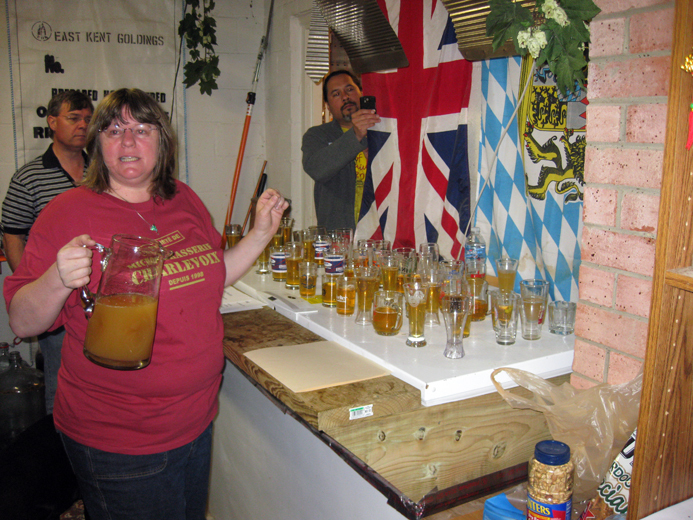 They use about one part orange juice to three parts Lambic blended from their barrels, force-carbed and served fresh. Despite the added sweetness from the juice the funk and sourness still came through nicely. Becky told me that she enjoys it fresh, but enjoys it most after it has a month for the orange juice and beer to mingle. Next up was the calibration beer, a corked-and-caged magnum of Gueuze from a blending session a few months earlier. It had a moderate acetic character, a big range of fruit flavors (lemon, apricot, over-ripe pineapple etc...), and a nice earthy funk (needless to say the best homebrewed Lambic I've tasted, well maybe the second best compared to a different blend of theirs I tried last year). For the base beer they use pils along with 50% wheat (both malted and un-malted), plus plenty of aged hops in the boil. 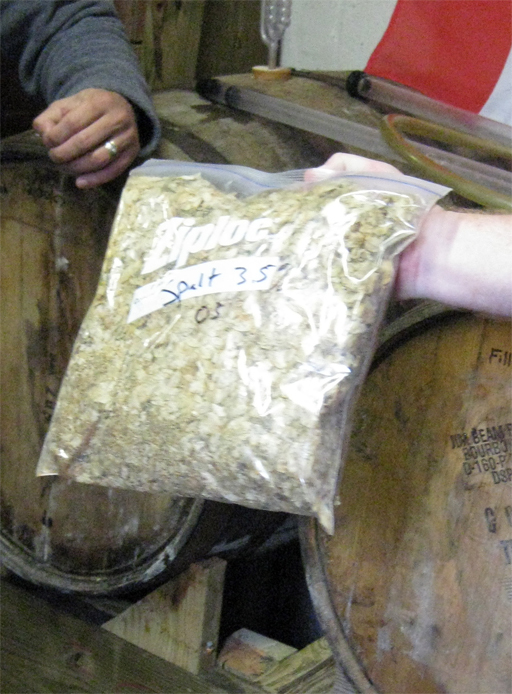 The hops smelled like old hay more than anything else, although there was a bit of funk to them. For fermentation Dave explained that he originally bought commercial pitches of the various microbes from Wyeast (nearly 10 years ago), but now to get a new batch fermenting they rely on the microbes resident in the barrel and in a pitcher of beer from an older batch. After we had finished the calibration beer the actual blending session began. Everyone got a glass of beer from each of the four barrels (brewed 2006-2009). The 2006 had a strong acetic/vinegar character, along with some solvent and nail-polish remover aromas. The 2007 could have stood on its own, lots of lactic acid, and some big fruit flavors. 2008 had a big earthy-mushroom aroma, but not much in the way of sourness yet. The 2009 was fresh and fruity, with some sweetness still evident. All interesting beers, but none of them had the complexity and balance of the calibration beer. The Pyles don't top their barrels off with fresh beer to account for evaporation or removal of beer, allowing them to continue aging partially full until the last of the beer is blended off. This exposure to oxygen in the headspace probably explains why their older beers develop an acetic character (vinegars are often aged in partially filled barrels to encourage the formation of acetic acid). The level of acetic acid would be a negative if you wanted to drink the beer straight (the 2006 was close to undrinkable alone), but it became a positive addition to the blend, even for someone like me that doesn't like much acetic acid in his sours. With eight years of experience blending Lambics Dave and Becky were quickly able to agree on the ratio they wanted. They went from tasting the beers separately to filling their bottling bucket with an approximate blend, without stopping to do a small scale test blend first. The the 2007 and 2009 comprised the bulk with about a half gallon of the 2006 for sharpness and maybe a gallon of the 2008 for earthy aromatics. They tasted the blend several times adding more from several of the barrels (they had left extra space in their bottling bucket initially to ensure they had room to add more beer) until they reached the blend they were looking for. Each of us made our own small scale blends using what was left from our sample glasses. I liked a softer blend of just the 2007 and 2009, how it would change in the bottle with carbonation and additional age is beyond me though. It was interesting to taste the blends that other people concocted, a wide variety of blends produced palatable results (it is a pretty easy technique to start playing with). 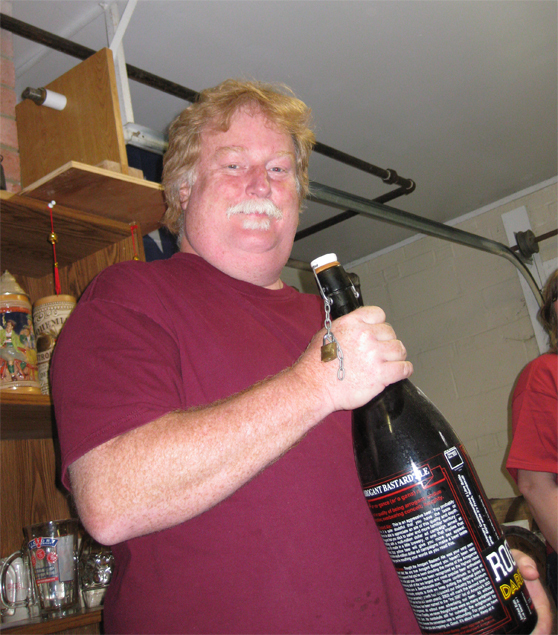 Dave finished off the day by popping open a 3L bottle of their Kriek. For fruit flavor they used 48 oz of sour cherry juice added to five gallons of beer in the bottling bucket. It was a good level of cherry as an accent without dominating the beer's character (think Cantillon Kriek more than Drie Fonteinen). Even with that amount of juice they still added a cup of priming sugar, giving the beer champagne-like carbonation. It will be interesting to see how the Gueuze they blended changes once it is carbonated, something the Pyle's assured us we would all be able to taste at a future BURP meeting. I left inspired to start a Lambic blending project of my own, especially after several lackluster attempts to produce a great Lambic without blending. It also inspired me to make a harsher tasting "acid" beer, aged with some oxygen exposure to give it an acetic edge for blending into beers that need some sharpness. Great synopsis of the blending day, Mike. It was truly informative, plus some of the best sour beers I've had. Lots of fun blending our own beers as well. The newest beer, the 2009, I assume still has some fermentables in it that the bugs can work on. How does one prevent bottles from becoming overcarbonated after blending and bottling? I've always wondered about that. Unrelated question. Due to your posts, I decided to pick up a 6 gal. better bottle to ferment in. I wasn't thinking and I assumed that my usual stoppers would work, but obviously they are too small. What do you use as a stopper and airlock combo on your long term sours? How cripes man, talk about a good way to spend a day. So they leave the barrels in the garage all year?!?! I figured the freezing temps of winter would have an adverse effect on the beers, clearly I am wrong. If anything their non-fruited lambics were low on carbonation even with the addition of ~1 cup of sugar per 5 gallons. Aging in a barrel for a couple years tends to knock nearly all of the residual CO2 out of solution. Doing a blend of multiple vintages of the same beer you could take a gravity reading before bottling and calculate the CO2 based on the expected final gravity (which would be close to the gravity of the oldest beer). It takes the fermentation of about .002-.003 to add a standard amount of carbonation to a beer (although that assumes that the beer is already saturated with CO2 from the fermentation so a barrel aged beer could take considerably more CO2). For long aged better bottle beers I like the silicone bungs. They don't dry out, and they have a lip to prevent them from slipping into the beer. For rubber stoppers I believe it is a #10. Yeah barrels in the garage year round. It is an attached garage though, so the temps may not get down sub –freezing. I’d be hesitant to try it in my detached garage, basement seems like the better option since if anything I’m more paranoid about letting them get too hot. PYLE-DRIVER! Got to get on the invite list (or sneak into) the next one. "For fruit flavor they used 48 oz of sour cherry juice added to five gallons of beer in the bottling bucket. Even with that amount of juice they still added a cup of priming sugar, giving the beer champagne-like carbonation." i'm with royski - that seems like an awesome experience. The bottle of kriek certainly had a violent pop when it was opened, but it didn’t foam over or anything. Cherry concentrate is much higher in sugar than juice. It looks like most manufacturers recommend mixing 1 part of concentrate with 7 parts of water to reconstitute it as juice. By my estimate 48 oz of juice will add ~5.5 oz of sugar, but in a beer that is completely flat and in heavy bottles it didn’t seem to be a problem. I see that they used old bourbon barrels, could these be used if you just cleaned them first or would you have to do the process that used? I would use the barrel to age a lambic in the same as they did. The 2009 was actually aging in a second use bourbon barrel that had not been taken apart and cleaned. At this stage it did not have any inappropriate oak character. I would certainly not do a Lambic with a fresh dumped barrel, run a couple bigger/darker sours through there first. So like a flanders or a sour brown ale? Sure, the Jolly Pumpkin La Roja Grand Reserve is finished in bourbon barrels. You could even go off-style, our bourbon barrel sour wee heavy is pretty amazing (pretty much ended up as a big oud bruin). Should be posting a full review shortly, but a year in a fresh spirit barrel is going to leave a pretty big impression on the beer. Lol I'm totally loving this blog and normally am unable to comment due to that function being blocked at work. But big thanks to Mike for helping us all become better sour brewers, or at least trying different things we might not have thought of! I found this post very interesting. A few questions arose after reading it, mainly about production methods they use. If they leave head space and only rack once a year, are all four barrels pulled from every year? If so do they only fill a barrel once every few years? I thought it relevant to have some very sour beer around for blending. What I am thinking is mainly a lacto soured pale in a keg. A whole barrel seems like quite a lot. My main worry would be that at some point you would have more undrinkable blending beer than you could use. This all comes up because I am thinking about moving up from two 63 gallon wine barrels to four. My barrels are only 4 months old and I don't want to over commit to a process that will yield be questionable results. Thanks for all the great information on sours and brett beers. They pull multiple times a year to blend batches, generally using all 4 barrels in part. They have filled a barrel each of the last four years, so that is about how long it takes them to blend off a whole batch. I'm not sure how much was left in each of the barrels though, not sure if they eventually dump a beer when it gets too acetic/sour to make room for a fresh batch (or if they save it in a keg/carboy). Good luck on adding to your barrel fleet, I'm hoping to add a second sometime soon. For acetic beer I'm more inclined to go with a small open fermented batch. For lactic a low gravity, nearly un-hopped pale or weisse in a keg seems like a perfect solution. If given the chance it might be a nice blog piece to do a full brew day with them. Get a chance to hear about the trails and tribulations of different process that worked or did not. Do they use a primary yeast or just the bugs present in the barrel?